Massimo Vignelli visited RIT Sept. 16, 2010, for the official launch of the Vignelli Center for Design Studies, adjacent to Booth Hall. 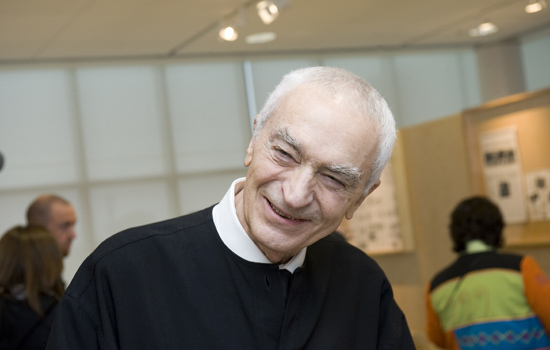 Vignelli and his wife and design partner, Lella, spurred the creation of the center by donating their archives to the university. Massimo Vignelli, arguably the greatest designer in modern history and whose Vignelli Center for Design Studies placed Rochester Institute of Technology onto the international forefront of design studies, died in Manhattan on May 27 after a long illness. Mr. Vignelli, whose influence spanned from package design to houseware design and from furniture design to public signage, was 83. Fiercely devoted to the Modernist tradition, Mr. Vignelli’s designs focused on simplicity through the use of basic geometric forms in all his work. “We are grateful to have Massimo’s archives so that we may help with his legacy through the education of students and visitors to the Vignelli Center here on the Rochester Institute of Technology campus,” said Lorraine Justice, dean of the College of Imaging Arts and Sciences. R. Roger Remington, RIT’s Vignelli Distinguished Professor of Design, said the design world has lost an icon. The Vignellis were honorary trustees of RIT when they donated their extensive career archive. The collection is the major resource at the Vignelli Center for Design Studies. The archive, building and programming serve as a permanent remembrance of this master of design. Born in Milan, Italy, in 1931, Mr. Vignelli studied architecture in Milan and Venice between 1950 and 1953. He married Elena Valle (Lella), also an architect, in 1957 and together established the Vignelli Office of Design and Architecture in Milan in 1960. Feeling the powerful influence from the nearby Swiss, the city of Milan was a dynamic graphic design environment. Mr. Vignelli expanded his professional interests from architecture to graphic design. Max Huber was an especially important influence. By 1965, having emigrated to the United States, he co-founded Unimark International Corporation, and then, in 1971, with Lella, he opened Vignelli Associates. Vignelli Designs followed later in 1978. Many of his landmark projects are now archetypes in the history of design – namely the corporate-identity program for American Airlines (1967), the graphics program for the United States National Park Service (1977), the design of St. Peter’s Church in New York (1977) and the original subway map for New York Metropolitan Transportation Authority (1970). His speaking and writing helped spread his Modernist aesthetic through a series of books, particularly design: vignelli (1990), Lella and Massimo Vignelli: Design is One (2004), Vignelli: From A to Z (2007) and The Vignelli Canon (2010). Next month, RIT Press will publish Lella and Massimo Vignelli: Two Lives, One Vision, a book focusing not only on the Vignellis’ work but on their lives, relationships, influences, and influence upon many others since their careers began in the 1950s. The permanent collections of the Museum of Modern Art, the Metropolitan Museum of Art, the Brooklyn Museum, the Cooper-Hewitt Museum in New York, the Musee des Arts Decoratifs in Montreal and Die Neue Sammlung in Munich all include Vignelli design. Mr. Vignelli received many awards, including an honorary doctorate from RIT in 2002, New York Art Directors Club Hall of Fame in 1982, AIGA Gold Medal, the first Presidential Design Award in 1975, and the Medalist Award from the Architectural League in 2010. Exhibitions of Mr. Vignelli’s work have been shown internationally. A major exhibit titled “Design: Vignelli” toured Europe between 1989 and 1993. Professionally, he has provided leadership for the Alliance Graphique Internationale (AGI), the American Institute of Graphic Arts (AIGA) and The Architectural League. Several feature-length films and videos have been produced documenting the Vignellis and their design work. Among these are works by John Jacobson, Roberto Guerra and Kathy Brew, whose latest video Design is One is soon to be released. In addition to his wife, Lella, Mr. Vignelli is survived by his children, Luca and Valentina, and three grandchildren. According to Justice, funeral arrangements are pending.